Among the magenta splats and strong dark lines that drag the eye across the distorted faces on Sterling Witt’s canvas are what appear to be deep-tissue scars. The 3- to 5-inch gashes look purposeful and dramatic. Witt says they are spontaneous and singular. 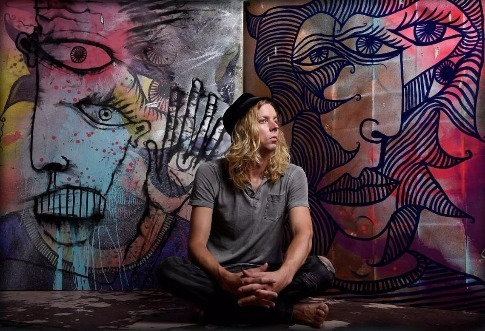 He lays a 48-by-60-inch canvas on the ground and sets enamel spray paint cans arbitrarily across its surface, he says. Then he takes out his gun. “I shoot the cans and they explode all over. With that I get spontaneous creation that can’t be re-created. Then I see what’s there to work with,” he says from his downtown home, a remodeled industrial space. ​Sterling Witt likes to control all the variables when he exhibits his work. His abstract faces are created in part by shooting a .22-caliber rifle at spray-paint cans. His work will be on display Aug. 5-31 (2016) at Revolution Records, 1830 Locust St. The 38-year-old local artist and musician will show several pieces from his “Gun Art” series atRevolution Records starting Aug. 5 (2016). He says the kind of art he’s interested in, both from other artists and himself, has a certain magical quality to it. “It seems to be all the paintings I like by other artists have this nature of — it’s a bit chaotic, and it’s like their mind exploded on the canvas, you know? There’s something special. The artist hasn’t been showing his work much lately at galleries. His art is selling fine, though, mostly through sterlingwitt.com and personal interactions. And he has been showing his pieces, just not in traditional venues. A couple of times a year for the past seven years he has hosted what he calls Art Farm Festivals at his property near Harrisonville (it’s also where he does his “Gun Art” pieces). These are all-night events with food, drinking, and plenty of music and art. He likes showing in his own space because he is able to control all the variables. “That’s been my gallery. I can control the lights, manipulate the furniture, I can do anything I want at the Art Farm,” he says. He details his dream show, an ultimate art experience based on a version that’s happening in Manhattan’s Lower East Side through a company called Chocolate Dances. The design of the chocolates is also inspired by his art. He would like to move the show to Kansas City and stage it in a gallery setting with his actual watercolors behind glass, so the show would feature performance and visual art. Witt is pleased to be part of the first anniversary exhibition at Revolution Records, in part because it will be more of a sensory experience than simply an art exhibition. He’s the featured artist and the featured musician. As far as he’s concerned, there’s not much use in separating his love of music and art.